Kamikaze Cleaning™ is the first in a series of three books written for the struggling homemaker. This book is written for the homemaker whose home has gotten out of control. It is to the point where people are not allowed in. If your house is like that now or has rooms where you always close the door when someone comes over, this book can help you. The next two books, due out in early 2010, are for those who are struggling to keep on top of the housework but the house has not gone totally awry. My house was not always a disaster. When I first got married, I could keep the house looking great. We had people over once a week for dinner and things ran smoothly. Now, fast forward through ten pregnancies in ten years. Five of those were miscarriages, so I basically went through the first two to three months of pregancy, followed by a period of recovery. The other five pregnancies gave us our five children. Any way you slice it, I was not in top housekeeping form for much of those ten years. Fast forward a couple more years filled with doctor appointments for a serious medical problem for our youngest, a parent with Alzheimers moving in for seven months, and homeschooling. OK, that last one is self-inflicted but it still adds to the workload. During the later years, I just let the house go. There was so much else going on that I couldn’t face the mess. I mentally blocked it all out. But it got to a point where something in my life had to give. I was miserable and decided that of all the things going on in my life, there was one in particular that I could do something about: the house. I dutifully bought some housekeeping books and tried to implement them but they didn’t really help. My house was too far gone. Going through the house cleaning one small area at a time was not working. It was discouraging to find those areas back to their original condition as I struggled to clean up the next area. So I decided to get really practical. As I looked around I was filled with discouragement as I realized that I had broken one of the first rules of housekeeping: everything must have a home. Always one to look on the bright side, I quickly decided that wasn’t true. Everything did have a home. It was just out in the open where I could see it. I am a visual person so I use visual clues to help me remember things. All my stuff was right where I needed it — where I could see it. But the problem was so could everyone else. During all this, my husband has been a real trooper. He recognized the signs of disaster early in our marriage. However, I was from a family of ten girls and my mother trained me how to do housework. I knew how to clean a house. What I didn’t clue into was how to manage it all on my own, especially when things got tough. So, my husband has suffered right along with me. My housekeeping skills (or lack of them) had driven other people away and I didn’t want them to have the same effect on my husband. My radical solution was to just take everything that was lying around and get it out of sight. I didn’t have the emotional energy to deal with the stuff at that point. I just wanted it gone. But I couldn’t decide what should stay and what should go. For example, how many cars, trucks, trains and LEGOs are too many when you have four boys? How many large pots do you need to keep when most of your friends have large families so cooking for guests usually means at least 10-12 people? At this point, I didn’t even know what I had in the house, much less if I needed it. My answer to this dilemma is laid out in detail in Kamikaze Cleaning. It was the disaster recovery stage of what became a year long process to get my house back in order. 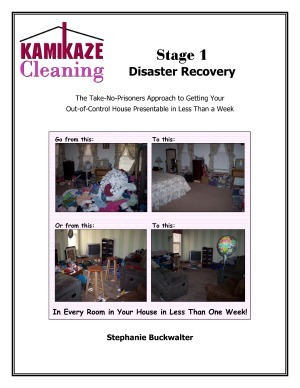 If you identify with any of my story, I believe Kamikaze Cleaning can help you reclaim your home, too. I have one more book coming soon that will continue the process and finish the job, but this one can get you started and give you the courage to face your stuff. Not all pictures used as examples are of my house. Some are from other women who, just like you, struggle to keep up with everything.